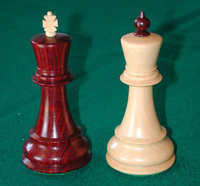 This unique wooden set comes with two different interchangeable finials for each king! Cajun Chess is pleased to feature this true chess classic! Finely carved and crafted "with a distinct European flair and styling..." this unique wooden chess set is a House of Staunton original. The tournament-sized set features a 3.875" King with a 1.75" diameter base and weighs an impressive 47 ounces. Total Set Weight is 47 ounces (1.33 kg) (Weight is of the standard 32 pieces and does not include the extra queens). Total Number of Pieces: 34(Including 2 additional queens). A bit of design history: From September 6th to October 31st of 1959, eight of the world's strongest Grandmasters competed in a powerful quadruple Round-Robin Tournament, played in Bled, Zagreb and Belgrade, Yugoslavia, to determine the challenger for the crown of World Champion, then-currently held by Soviet Grandmaster Michael Botvinnik. Amongst those competing were the young American Robert James "Bobby" Fischer. In commemoration of that classic struggle, Cajun Chess is delighted to feature the Zagreb'59 Commemorative Chess Set, designed by the legendary House of Staunton. 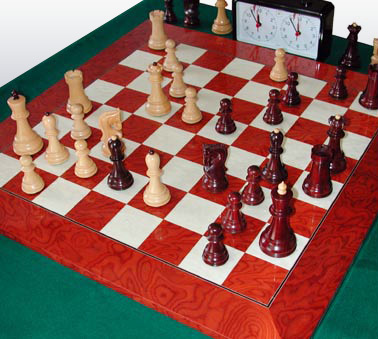 It is a stunningly accurate reproduction of one of the most popular chess sets used in the major International Tournaments during the 1950s and 1960s. is the interchangeability of the kings' "finial"(small decorative piece atop the king). The set comes with two different finials for each king: A classic eastern "ball"-style, and a "Form�e" "western-style" cross; and the dark/light colored finials can of course be interchanged between their respective pieces too, as shown in the photos - for a charmingly dramatic effect. A beautiful wood chess set!